Hiro (Kyoto, Japan) on 20 March 2019 in People & Portrait. 輪島 Wajima is a city is in 能登半島 Noto Peninsula facing the Sea of Japan. The city is known for lacquer ware (japan) and seafood. 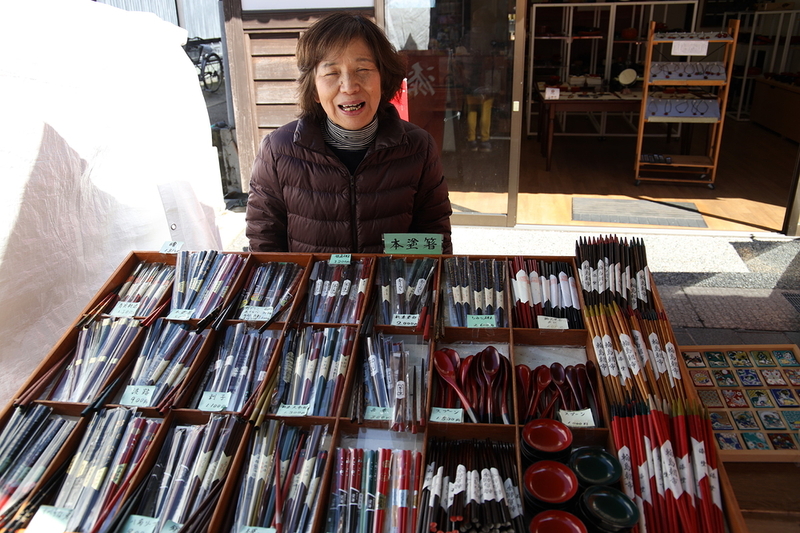 She sells lacquered chopsticks in the morning market. I bought two pairs for me and my wife. Cannot fault the presentation ! A nice choice of lacquered chopsticks, I would also have bought some, the merchant seems nice! Excellent image Hiro. Great choice of items to buy. Great smile from this friendly vendor! I love the wares. Lovely laquer chopsticks and small bowls..
She looks a bit sad..Hope she was able to sell a lot :)))A very nice portrait here. A friendly merchant and composed beautifully. The lady has pleasure in her work. It is difficult for us to eat with sticks. Nice shot. A beautiful scene of life ...! J'ai plusieurs paires de baguettes mais je lui en aurais bien acheté quelques-unes. A very happy lady and charming portrait. Her lacquerware items are quite beautiful. Superb portrait of the saleswoman and her merchandise . So many to choose from. I like the different colors. A wonderful portrait!